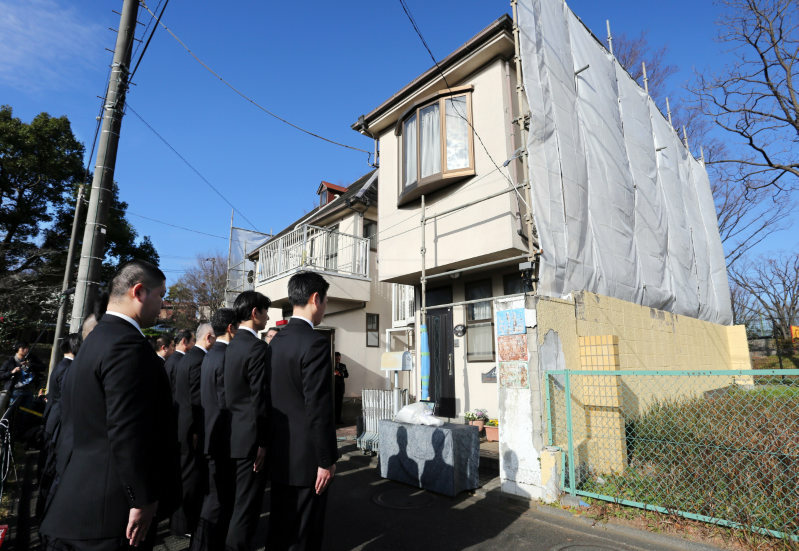 Dec. 30 marked 15 years since the murder of a family of four in Tokyo's Setagaya Ward, and police investigators vowed anew to solve the cold case in front of the victims' home that day. Mikio Miyazawa, then 44, and his wife and two children were killed at their home on Dec. 30, 2000. While a total of 246,044 investigators had been deployed to probe the case as of Dec. 30, 2015, they are yet to track down the perpetrator. On Dec. 30, investigators from the Metropolitan Police Department's (MPD) Seijo Police Station offered flowers and silent prayers in front of Miyazawa's home. According to the investigation headquarters, it had received a total of 12,545 pieces of information related to the case by Dec. 29 -- of which 324 came in this year. As the statute of limitations for murder and other crimes were abolished by the 2010 revision to the Code of Criminal Procedure, the MPD is set to continue probing the case by upholding a dedicated task force. Hiroshi Tsuri, head of the MPD's first investigation division, said, "We will investigate the case with a conviction that we will definitely arrest the perpetrator." Also on Dec. 30, about 30 people including members of "Sora no Kai," a group of bereaved family members of murder victims and neighborhood association members, distributed 2,000 flyers calling for information about the case in front of Chitose-karasuyama Station on the Keio Line. The Sora no Kai members have continued similar activities at train stations close to Miyazawa's home every month since July last year, on the monthly anniversary of the slayings. On Dec. 30, they were joined by Setsuko Miyazawa, the 84-year-old mother of Mikio Miyazawa. "I want people to provide information and hope the perpetrator turns themself in," she said. If anyone has any information about the murder case, call the investigation headquarters at: 03-3482-0110.